A month ago, there were 63 ornaments on WKYC’s holiday tree. Each one listed a gift for a child living in a local foster home. But tonight, our tree’s emptiness is something we celebrate. Every single ornament was carried away, each handwritten wish – from art supplies to a Nintendo Switch – was fulfilled by WKYC and its employees. And on Tuesday, WKYC delivered those gifts to children living in foster care, as well as carloads of other items donated by our viewers. 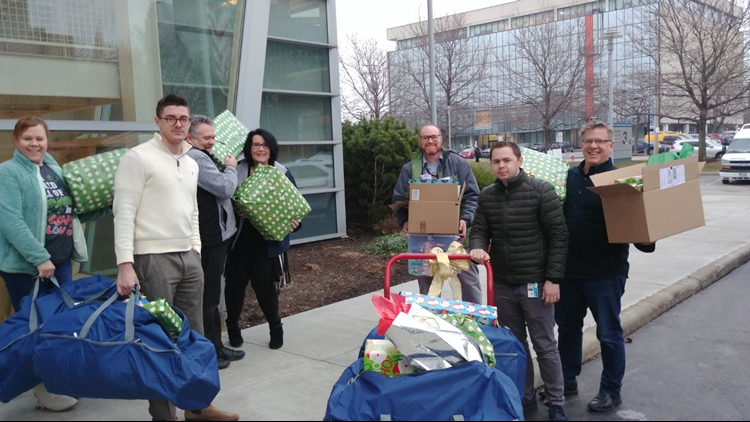 The holiday gift delivery is the result of a partnership that began months ago during a meeting between WKYC staff and Fostering Hope, an organization which provides services to boost the social-emotional health of more than 1,000 local foster children. “There are more than 2,000 foster children in Cuyahoga County, and that number is increasing with the opioid crisis. Our kids are in between the lines of every story you cover,” Fostering Hope executive director Nicole Shefrin told us. WKYC employees agreed they wanted to reach out to these often overlooked youth, and so the station registered to “adopt” 17 girls through Fostering Hope’s Gift ‘N’ Greet program. In addition to donating the girls’ wish list items, we also purchased gifts that the girls wanted for the communal areas at their Ohio Guidestone foster homes such as craft kits, a projector, movie screen and a Bluetooth portable speaker (requested because the girls like to have dance parties). For WKYC employees, knowing that these foster children won’t be able to spend the holidays with their biological families is what drove them to give deeply. “No child should wake up on Christmas morning without a present. 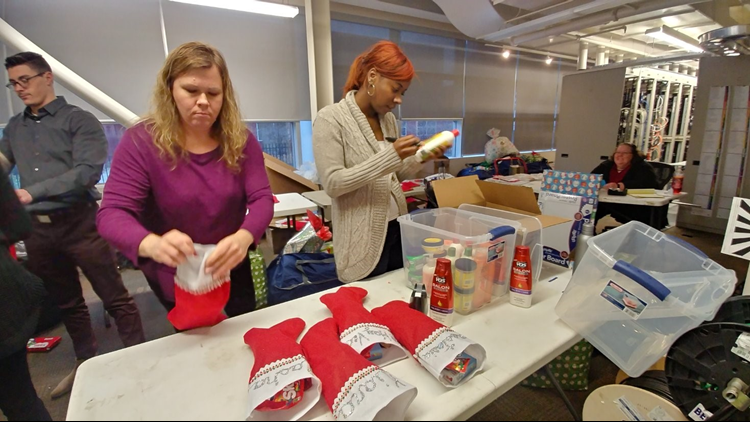 They’ve already gone through so much, by not being with their family and loved ones for whatever reason,” said Darlene Wodek, co-captain of the WKYC holiday drive. WKYC also shined light on the issues faced by foster children, as part of our Fostering Hope partnership. WKYC Senior Health Correspondent Monica Robins did a Giving Tuesday story on the plight of many foster children who carry their belongings in trash bags as they move from place to place. Her story motivated our viewers to donated more than 50 duffle bags and comfort items to children served by Fostering Hope. “We reached out to our viewers and they responded. It was amazing what they did,” Wodek said. We’re grateful to the following companies for their donations: Wal-Mart in Strongsville, Medina and Fairlawn; Longwood Beauty Supply in Maple Heights; T.J. Maxx in Brooklyn, and Pat Catan’s, Parma. Rascal House donated pizza for the holiday party tonight. Calvert Wire & Cable supported our holiday with a corporate donation and its employees also raised money through a raffle to provide us with journey bags, toiletry kits, pillowcases and journals for our 17 girls. And special thanks go to the employees at J. C. Penney Great Northern, who bought clothing items and bedding for our girls.